The Global Financial Crisis (GFC) of 2007 was a major event and a key milestone in the history of financial markets. Unparalleled in many respects, its economic consequences were stronger and its global impact wider than all earlier financial turmoil. 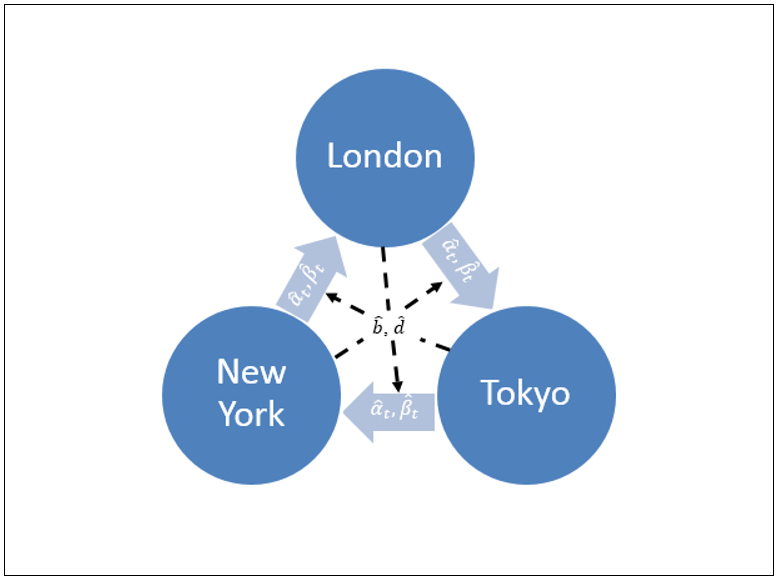 In our paper, we analyse the effects that the GFC has had on the evolution of interdependence of the three largest stock markets of London, New York and Tokyo, as the representative security trading centres in their broader geographical regions of Europe, North America and Asia. Using the framework of the Foreign Information Transmission (FIT) model, we investigate inter-market relations through direct and indirect channels of information transmission and we analyse the impact of other factors, such as differentials in trading volume, stock price volatility and interest rates, on the direct channels. Figure 1 below presents schematic description of the FIT model’s relationships (and the key parameters that describe them), which we deal with in our study. Our empirical results indicate that the influence of the US market has weakened after the GFC, while the role of the main trading centres of the other two regions has strengthened over time. These findings are consistent with the concept of a geographical shift in the balance of economic powers between countries. A possible explanation of our findings may be related to the fact that the centre of gravity of the GFC moved geographically from the USA to Europe soon after 2007 when many South European countries experienced macroeconomic problems and faced serious debt crises. However, the findings presented in our study may also reflect a different phenomenon, namely, broader macro-economic trends on a global scale. An explanation related to the geographical shift in the balance of economic power between countries calls for further research on the evolution of stock markets interdependence and the changing role of other stock trading centres located in different geographical regions across the world, including those that are still considered today as emerging markets. Read more in the Financial Geography Working Paper #8.